If you're looking for a full-body workout that doesn't involve spending countless hours at the gym, consider rock climbing. Rock climbing involves using both your mind and body as you figure your way up to the top. 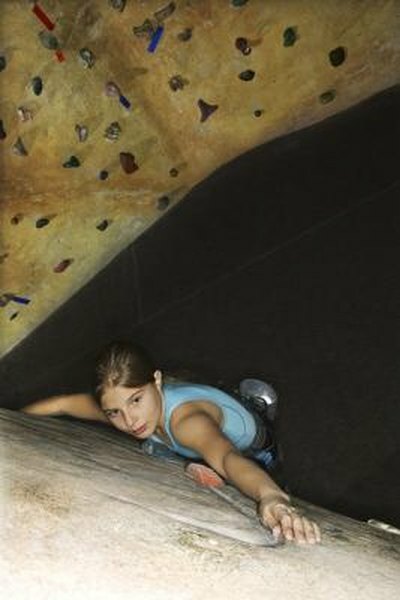 Many gyms and fitness centers, as well as parks throughout the nation, offer rock climbing areas and facilities for people of all ages. Sure, you have Sudoku and other mental games but rock climbing is a lot like solving a puzzle. As you make your way up the wall, you assess your climbing options as well as all the ways available to continue moving up. As you become more familiar with rock climbing, you may assess the correct route without even making your first move. Rock climbing hones your concentration and critical thinking skills as well as planning, problem solving and determination. Nothing feels as good as reaching the top. From your fingertips to your toes, just about every major muscle group is involved during rock climbing. You use your fingers, hands, arms, feet and legs to grab, reach, step, pull and push yourself onto the next ledge, spot or point. Your shoulders and upper body muscles provide your arms the strength to pull yourself up the wall while your abdominal muscles and glutes provide the strength to push you up and keep you balanced. Even the muscles in your feet will get a workout as you use them to keep your balance on small footholds and in cracks. Not only does rock climbing build and tone muscles, it is also an effective way to burn calories and lose weight. In one hour you can burn up to 800 calories, which equals as many calories as swimming for an hour at a highly intense pace. Rock climbing also improves your flexibility and coordination and provides an adventurous way to exercise, something that can't be said about traditional fitness programs and exercise routines. Most rock climbing courses involve some form of training. Find out more information before attempting to climb a rock wall. Always stretch your muscles before rock climbing. Most common rock climbing injuries affect the fingers, shoulders, back and leg muscles. When you're not rock climbing, build your muscular strength using weight machines or various weight-bearing exercises such as pushups, pullups, front planks, lunges and squats. Take a break in between climbs and refrain from climbing if you feel tired or scared.